For daily wellbeing is an expert formula of 6 different probiotic strains such as acidophilus, combined with prebiotics (food for the probiotics to flourish) to help maintain overall digestive health, immunity and energy levels on a daily basis. What's it for? Probiotics & Prebiotics to help maintain overall digestive health, immunity and energy levels on a daily basis. This formula from OptiBac Probiotics promotes a healthy balance of friendly bacteria throughout the entire intestinal tract. In For daily wellbeing, the acidophilus and other probiotic bacteria along with the prebiotics have been selected for their specific clinically proven health benefits they convey in the different parts of the small and large intestine or colon. For daily wellbeing provides a high potency and select variety of well researched and documented probiotic strains. 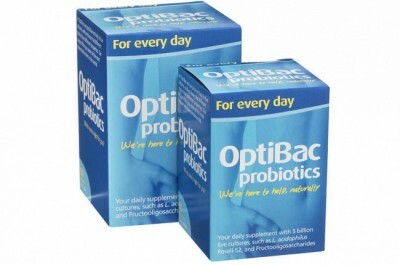 - With no added sugars, artificial flavourings or colourings, OptiBac Probiotics For daily wellbeing provides a healthy alternative to sugary probiotic yoghurt drinks. Lactobacilli Strains: Lactobacillus acidophilus Rosell-52 and Lactobacillus rhamnosus Rosell-11 are amongst the most well-researched and documented species of probiotics naturally resident in the human gut. Our rhamnosus and acidophilus strains have been studied to survive the gastric acidity and bile salts expected at mealtimes and to reach the intestines without damage; where they colonise, support immune cells and create a healthy lactic acid environment that limits survival of harmful bacteria. Bifidobacteria Strains: Bifidobacterium longum Rosell-175, Bifidobacterium breve Rosell-70 and Bifidobacterium bifidum Rosell-71 colonise primarily in the large intestine (or colon). Here they promote the production of antibodies, support the body against toxins and inhibit the development of undesirable bacteria by competitively excluding their attachment to the intestinal wall lining. A healthy balance of Bifidobacteria furthermore supports the intestines in assisting transit and optimising a healthy frequency and regularity of bowel movements. Lactococcus lactis Rosell-1058: This strain is obtained from the kefir culture and is renowned for its antimicrobial benefits; supporting the body against undesirable harmful bacteria and some fungi. Prebiotics: The non-digestible prebiotic FOS (fructooligosaccharides) acts as a food source to stimulate growth of the bifidobacteria in particular; creating what is known as a 'bifidogenic' effect. The synbiotic relationship between probiotics and prebiotics in the colon has a great impact on supporting intestinal health and wellbeing. OptiBac Probiotics guarantees 5 billion live micro-organisms per vegetarian capsule until the best before date. Daily dosage: 5 billion. Click the button below to add the OptiBac Probiotics For every day 30 caps to your wish list.